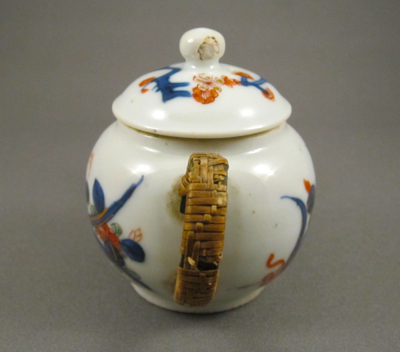 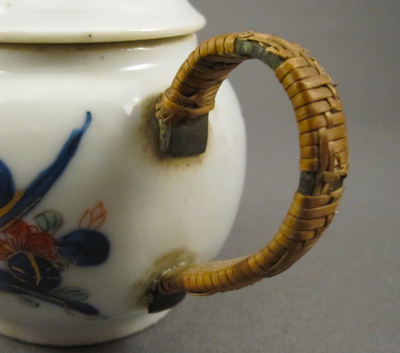 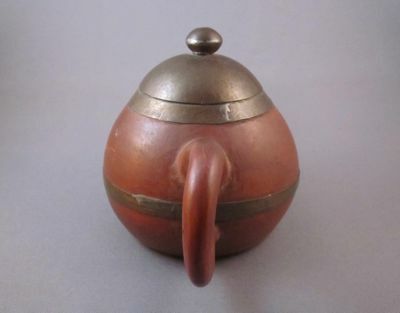 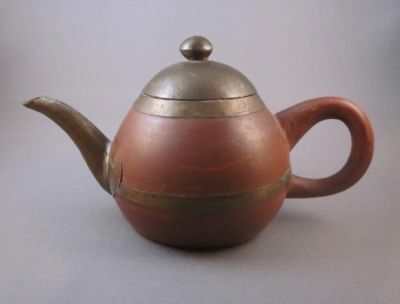 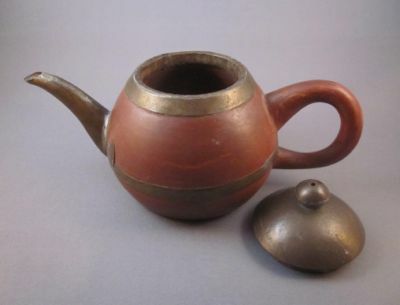 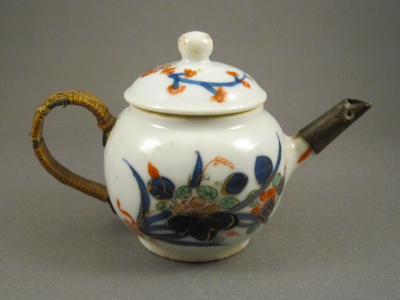 This wee globular form teapot was made in China during the Kangxi period (1661 – 1722) and measures just 2-1/2″ high and 4-1/4″ from handle to spout. 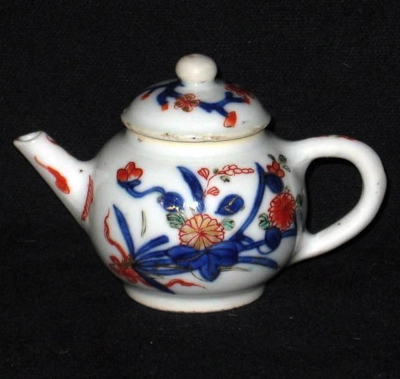 It has Famille Vert decoration of floral bouquets tied with ribbon in blue underglaze enamel, iron red and green washes, and gilt highlights. 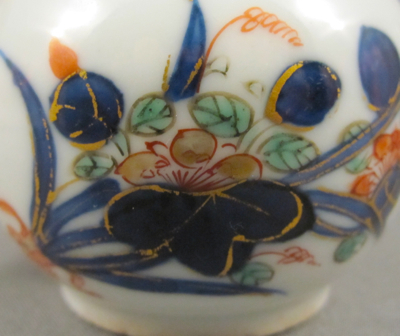 The domed cover, decorated with plum blossoms, has a tiny vent hole, just as its full-size counterpart would have. 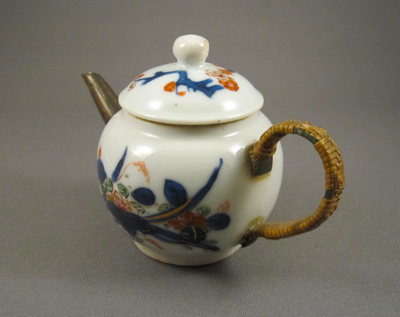 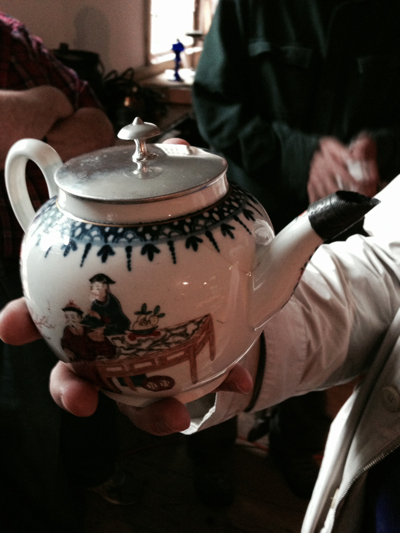 I believe that this was part of a larger tea set purchased for a child from a wealthy family, as only the upper class were able to afford imported Chinese porcelain. 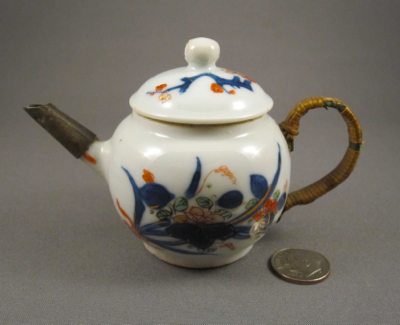 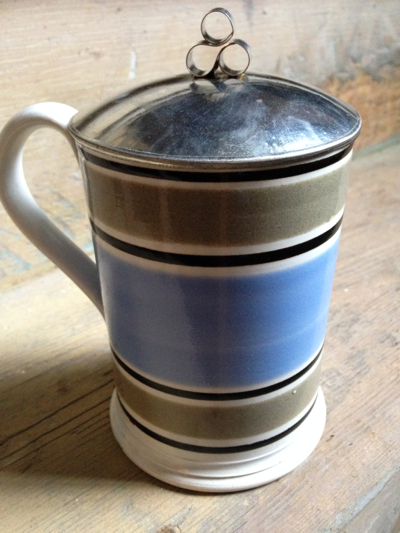 This nearly identical miniature still has its original handle and spout, but I think my teapot is the more interesting one of the pair. 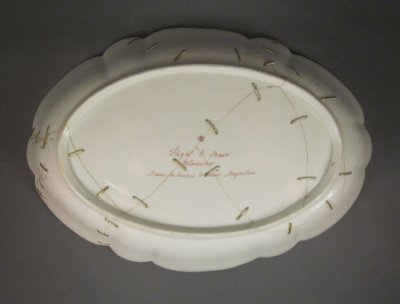 This high quality porcelain dish was made in Worcester, England, by manufacturers Flight & Barr. 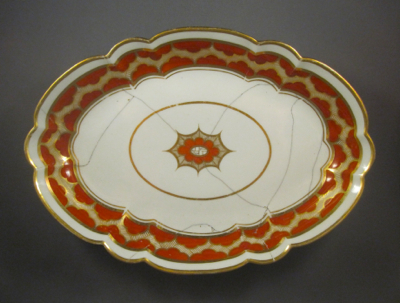 It is decorated with a wide Gothic influenced geometric border in gilt and burnt orange enamel. 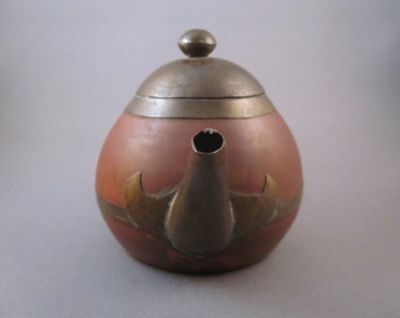 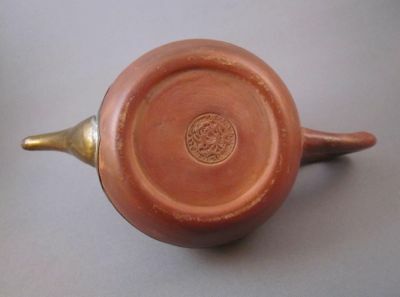 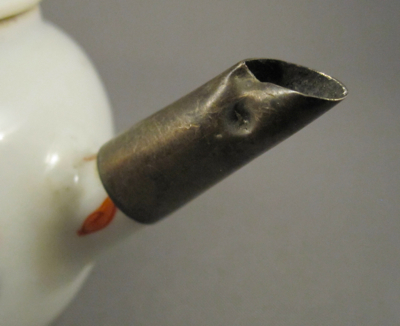 It measures 11-1/4″ by 7-7/8″ and dates to early 19th century. 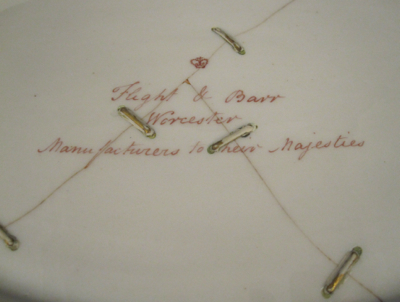 The underside has a beautifully hand painted mark in puce which reads “Flight & Barr, Worcester, Manufactures to Their Majesties,” as well as a small crown and an incised letter B. 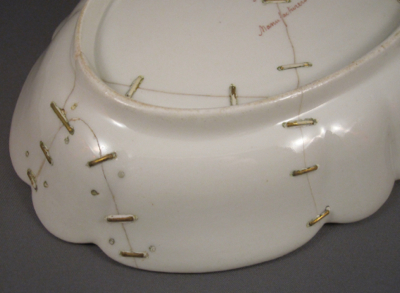 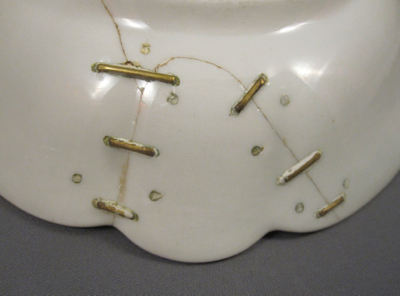 After the dish was dropped and brought to a china mender for restoration, 31 brass staples were attached to make the dish complete and usable once again. 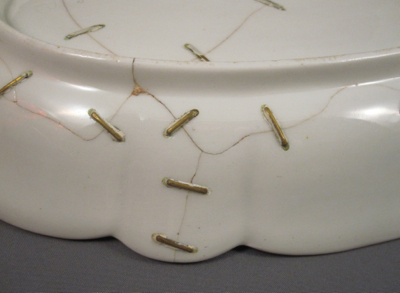 The eight holes in-between the six staples at one end indicate that an earlier repair was made to the dish, but apparently they were removed. 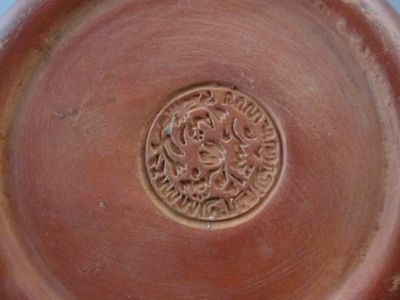 The second restoration, executed well over 100 years ago, was a success and the sturdy dish was most likely put back in service for use at the dinner table. 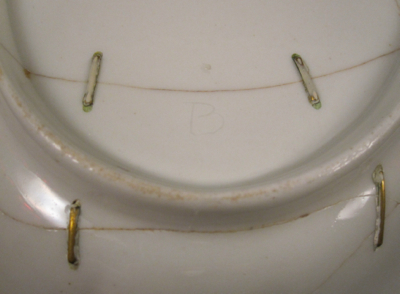 But I would rather just admire it for the beauty and ingenuity of the repair and display it wrong side up. 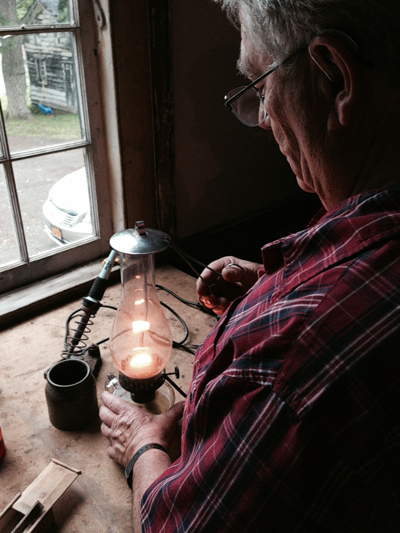 I gave a lecture and participated in a workshop, “Period Make-Do’s and How to Reproduce Them,” this past Monday at Don Carpentier’s Historic Eastfield Village in East Nassau, NY. 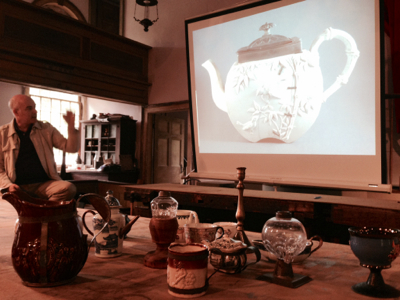 My friend Bibiana also participated in the workshop and took these photos of my presentation and of our work. 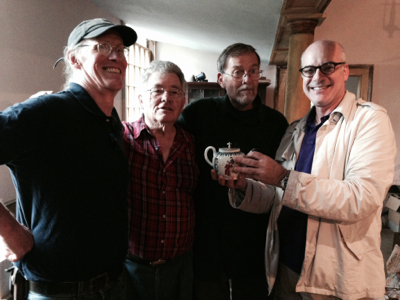 Instructors included Master Tinsmith William McMillen, expert Blacksmith and Tinsmith Olof Jansson, and Master of all trades Don Carpentier, who guided us through completing handmade tin replacement lids for my Worcester teapot and Bibiana’s banded mocha ware mug. 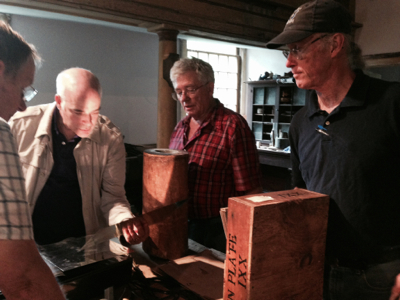 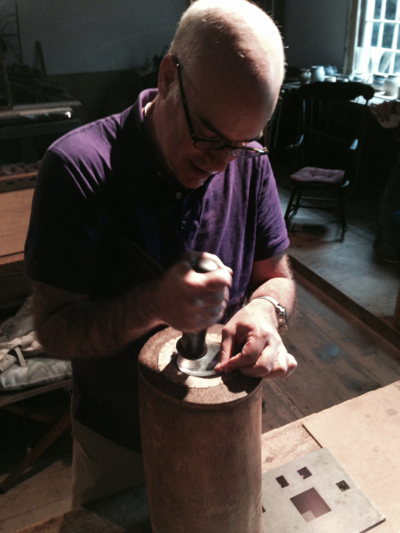 This was my second workshop on the art of repairing antiques with antique tools and employing the same methods as those of Early American tradesmen. 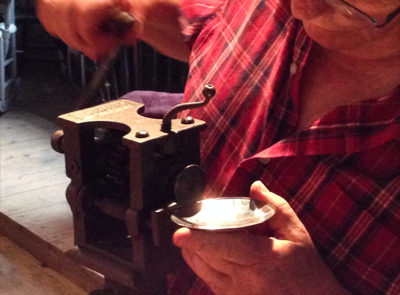 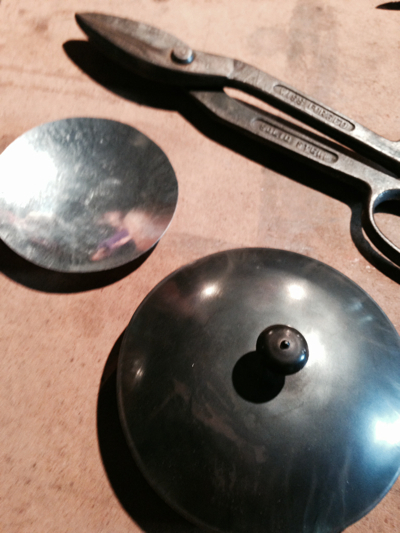 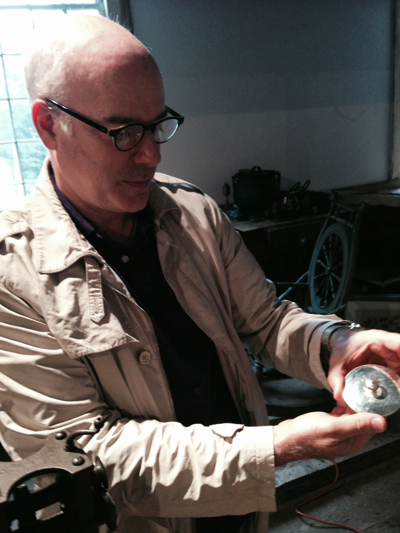 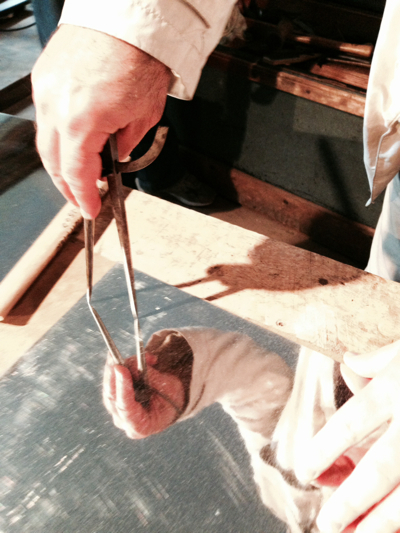 I am eager to continue my education in the craft of tinsmithing and learn more about how my great-grandfather, a Philadelphia tinsmith, most likely created a number of household items with inventive repairs of his own.